Art Kehoe is one of the truest Hurricanes the University of Miami has ever known. Not only did he play for Miami in 1979 and 1980, he is a 21-year veteran on the coaching staff. 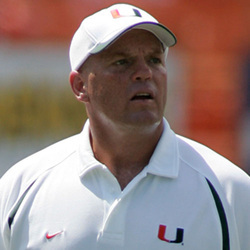 Kehoe, an offensive guard and team captain, was a two-year letterwinner at Miami after transferring from Laney Junior College, where he has since been inducted into its Hall of Fame. Coached by Howard Schnellenberger, Kehoe's 1980 team won the Peach Bowl over Virginia Tech, which may have been the precursor to the Hurricanes soon-to-arrive era of dominance beginning with the1983 National Championship. As a player, he played with the likes of Hurricane legends and current Hall of Fame members Jim Kelly, Jim Burt, Fred Marion, Lester Williams and Ronnie Lippett. As a longtime Miami coach, which began with his stint as a student assistant in 1981, Kehoe has been instrumental in the development of numerous standout linemen, including five First-Team All-Americans: Bryant McKinnie (2001), Joaquin Gonzalez (2000), Richard Mercier (1999), K.C. Jones (1996) and Leon Searcy (1991), plus a dozen more that went on to play professionally. It was Kehoe's most recent offensive line unit that solidified the Conshohocken, PA native as one of the greatest in the game. During the course of the 2000 and 2001 seasons, the offensive line gave up a number of sacks that can be counted on one hand. The line produced two first-team All-Americans and was loaded with All-BIG EAST selections. The offensive line also allowed the emergence of a young quarterback, Ken Dorsey, who led Miami back to the forefront of college football with a resounding 34-17 victory over the Nebraska Cornhuskers in the 2002 Rose Bowl National Championship game.